Woodford Reserve just did something very interesting, on the verge of awesome. For this year’s Master’s Collection release, they introduced TWO malt whiskeys – one aged in charred new oak (as is typical of bourbon), one in used (as is typical of Scotch). That’s right, these are malt whiskeys, which is highly unusual in the US and basically unheard of in Kentucky. AND they offer the chance to experience the difference that used vs. new barrels have on that malt whiskey. While I haven’t loved some of the previous Woodford Master’s Collection releases, this one definitely had me intrigued. Both of these are made from a 100% malted barley mash. Both are triple distilled in Woodford Reserve’s copper pot stills. Both are bottled at 90.4 proof. 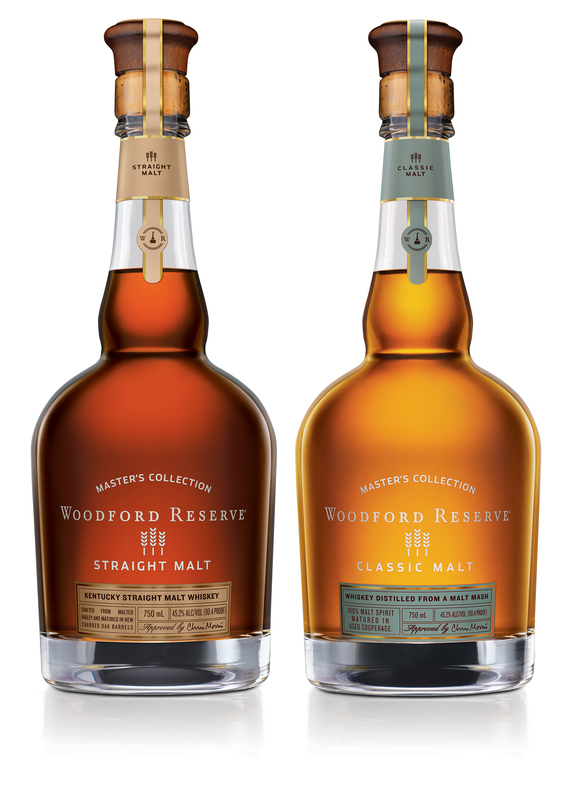 Both are aged around the same as regular Woodford Reserve, 6-8 years, though there’s no age statement on the bottles. In fact, per Woodford, the two “are only one week apart in age in the barrel.” It’s only the nature of the barrels used for aging that distinguishes the two. As for the the labeling on these two – I find it confusing as heck. One is labeled as “classic malt” and the other as “straight malt” – do you have any idea what that means? I sure don’t. Do either of those names do anything to convey the difference in barrel aging? Nope. Do either of them lead you to believe that the whiskey in the two bottles actually started off the same before going into barrels? Nope. Luckily, once you have both of these in front of you, a quick glance or a quick sniff tells you all you need to know about which one saw time in new oak vs. used. They are like night and day. And that’s the thing that just might hook whiskey enthusiasts out there into dropping a hundred bucks each for these two bottles. (Full disclosure: I was sent tasting samples from the distillery.) So, how are they? Let’s review these one by one, then I’ll do the obligatory compare and contrast. The color here is your first glimpse into the fact that the barrels used are… used. They’ve already been tapped out for maximum interaction between the whiskey and the wood, so the impact on color and flavor will be less dramatic. This “Classic Malt” is a pale but clear and bright gold color, think Chardonnay. On the nose, there’s a green character fairly prominently – you could say green wood, or green grain, but the thing that kept coming to mind for me was the smell of tomato vine. You definitely get the malt character on the nose as well, but it’s fairly subtle. Also subtle is the fruit – there’s a bit of something like candied lemon peel or lemon marmalade – but it’s not overtly citrusy or sweet. Sipping neat, there’s a good deal of heat for 90 proof – but it’s a tingly, mouth-watering heat. I felt from the first sip that this could benefit from water or ice. Grain is indeed the prominent flavor, that green character from the nose fades away for the most part, but comes back in a very pucker-y finish. It definitely shouts Scotch rather than Bourbon. And… at this point… not great Scotch. Adding a touch of water smooths things out considerably and brings out some fruit as well. A cube of ice does even better, making a pretty dramatic transformation, for me at least. The nose becomes more grain-centric, the green tomato vine dials back, and a crisp, buttery pear tart note comes out. On the palate, the ice does wonders. That pear tart profile comes through strong now, though it’s not at all sweet (so maybe a tart isn’t the right descriptor – think of a tart without any sugar added). The body and finish smooth out significantly as well. Really nice. The pear character here and overall grain profile reminds me of the St. George Single Malt whiskey out of California, which is a very good thing. The color is typical of bourbon of some age – a bright, full amber. The nose, too, heads in bourbon direction – bold, with some baking spice and vanilla coming through, a bit of orange zest, but mostly I get something like brown sugar oatmeal – a toasty, grain-driven nose with just a bit of caramelization. The sweetness is minimal, though, compared to bourbon. Sipping neat, this is fairly smooth stuff. All the way through the finish. Again, the malt grain is very present, but its bathed in orange rind, cinnamon, a bit of crisp pear fruit. I wouldn’t call it wood-y, but you definitely get the impact of that charred oak in the baking spice profile. A touch of water brings out the butterscotch, but interestingly… it also brings out the Scotch! That sounds like two different directions, and it is, but I really like how a bit of water manages to accent both the wood and the grain here. With a cube of ice, I’m digging this even more. It takes on a fuller, chewier feel in the mouth. Orange, baking spice, pear come more to the front ahead of the grain. The finish is warm and steady, though veers a bit into a tart and tannic direction at the end. Going back to comparing these two, which is the most interesting thing to me about this release – the impact of new, charred oak is very apparent. Even though these are both malt whiskeys, I think the new vs. used comparison also helps demonstrate one of the major general distinctions between bourbon vs. Scotch. You can really see how the new oak imparts color, aroma, sugar, flavor in a way that is dramatically different than what typical Scotch gets from its used barrels. For this “Classic Malt,” the used oak simply allows the grain to shine through to a greater extent. I like both of these, though my personal caveat is that they need the ice or a bit of water to show well. If I had to pick one, I’d actually go with the “Classic Malt” – because the combination of malt and used barrels is simply more unique for a Kentucky/US whiskey, and I just love that pear tart character that comes through with some coaxing. In a lineup of Scotch, would I call these stellar whiskeys? Probably not. But for their adventurous spirit, their uniqueness, and their education value as far as the impact of the barrel, I’ve gotta give them both an E for EXCELLENT. Customers have been asking for tasting notes and reviews of this new release. Your post a great starting point…should encourage the thirsty locals to pull the cork, so to speak. Will also be bookmarking your blog as soon as I post this comment. Thanks. “Classic malt” and “straight malt” actually are informative, it’s called “straight malt” because it satisfies the requirements of a “straight whiskey” in America (the term straight is used for rye and bourbon generally). Basically it means it’s aged more than 2 years in unused barrels. On the other hand, “Classic malt” refers to the classic way of making malted whiskey across the ocean, that is in used barrels. Since malt is usually the domain of Europe classic malt refers to the European style which focuses on grain character over barrel character. This stuff is absolute garbage. $95 for the nice bottle, $5 for the crap that’s inside. This stuff should cost less than $10 a bottle. We, the customers, should be offended. Way too young – less than two years? At least that’s how young it tastes to me. Who knows and who cares as, surely, Woodford won’t make this mistake again. Nor will any other distiller with some sort of decency. There’s no balance, no nose. In the mouth same thing – NOTHING. The only thing this has is a long finish – way too long because it stinks. I get bean sprouts, leafy greens, unripe tropical fruits, something vegetal, and lots of malt. Woodford, please stick to making BOURBON and leave the barley distilling up the masters – the SCOTS. Ugh. Mouth tastes like a machine squeezed raw oak juice into Colt 45 and I started chugging it. Don’t just avoid. R.U.N. A.W.A.Y.